Message 58193 - Posted: 6 May 2016, 20:31:36 UTC - in response to Message 58142. Arecibo has recorded very little data in 2016. Eventually we will be 90 or 100% breakthrough tasks. Well, since the RAC is dropping like a stone on main, I might as well spend some 24/7 testing here on main with my main cruncher. Let's see what it can achieve. Message 58207 - Posted: 7 May 2016, 20:37:27 UTC - in response to Message 58192. I don't understand why Eric (and/or other admins) want to send GBT .vlar tasks to GPUs. 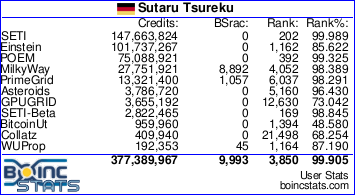 With the currently mix of Arecibo and GBT tasks at Main, there is no problem to feed e.g. my PC (example for a fast PC) for 24/7. Or Arecibo tasks will run out, just GBT tasks will come in future? How will look the mix in future? Answer is given. It's no work or slow work choice. Not slow work or fast work one. But the above mentioned tasks lasts just around 30 secs (hard to find time differences). Indeed, existing PGv8 set is too fast for high-end cards. So I would recommend for now to take one GUPPI VLAR task from here or main, to put it into bench and use it for tuning. If VLAR is "our new future" then it make sence to do best optimization under very VLAR task. The server/scheduler have decided that SoG is the fastest app (no surprise there). No screen lags ( no surprise there either, since I do not run the monitor on the 980, but on the INTEL Intel(R) HD Graphics 4600. No other type of machine lags either, even if I run 3 VLARs at a time. Completion times of VLARs, acceptable. Are you running 1 or 2 instances on the 980 Sten ? Message 58218 - Posted: 8 May 2016, 10:40:35 UTC - in response to Message 58217. As my command line states -instances_per_device 3. 3 instances it is, anything less is a waste of resources. I've tested SoG on main for a long time now. Over 25 thousand tasks finished. 4 is a little bit slower than 3, but it's really a toss-up. With lots of shorties, 4 instances is faster, but with a mix of ARs, 3 at a time is faster. With the summer coming, that will not be enough though. This room will get at 30-32 C, and I have to crunch mostly from late evenings, and to maybe 9 in the morning. I have a portable AC, but it isn't worth the electicity cost to keep it running all day, just to be able to run SETI. Just encountered a "finish file present too long" error on Arecibo mid-AR task 23790517 - it was sharing the GTX 970 with a guppi VLAR, running SoG r3430. So it looks as if there was an 18-second gap between calling finish and the app quitting, with BOINC pulling the plug at 13 seconds. Message 58220 - Posted: 8 May 2016, 10:54:52 UTC - in response to Message 58219. If I can help out by testing something, please let me know. Available hardware and software is listed in my profile here. Message 58221 - Posted: 8 May 2016, 11:04:56 UTC - in response to Message 58220.
xj dates from around 21 April. Raistmer's SoG r3430 dates from 31 March, so it's not really fair to blame him for not including that fix in advance. But it is a reminder that we perhaps need to consider 'hardening' SoG against this problem, if that's going to become part of the armoury for handling VLAR on Main. End of GBT VLAR fun it seems. Only Arecibo tasks downloading now. Message 58226 - Posted: 8 May 2016, 17:37:14 UTC - in response to Message 58221. Message 58229 - Posted: 8 May 2016, 18:43:58 UTC - in response to Message 58226. How much CPU of your 8 core were those 3 work units using? Message 58232 - Posted: 8 May 2016, 19:25:50 UTC - in response to Message 58229. Well, if they are GBT VLAR's, they use almost one core/thread each (95-99%). However I only run 3 CPU WU's, so 2 cores/threads are always free. Even "normal" AR's use lots of CPU with opencl_nvidia_SoG, or opencl_nvidia_sah, some of them almost a full core/thread, but usually from 40-80%. Only shorties use under 10% of a core/thread. I don't want to use sleep, because it really hits the performance. I can live with the high CPU usage. Message 58234 - Posted: 8 May 2016, 19:56:28 UTC - in response to Message 58232. That is what I was seeing as well. Since I was running multiple GPUs in mine, was forced to have -use_sleep in mine, really only extended the time by a few minutes. But like you, I want those few minutes, lol..
My problems, not enough CPU cores for all the GPU work units. Message 58238 - Posted: 8 May 2016, 20:50:46 UTC - in response to Message 58219.
app completely finished its own operation. 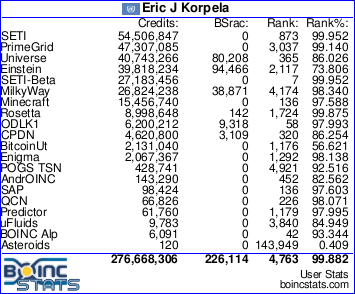 Worth to rise this case in front of BOINC API writers. Tasks ready to send 1339. Time to move back to main perhaps. Message 58266 - Posted: 9 May 2016, 14:32:08 UTC - in response to Message 58207. Since a few days I have 34 °C ambient in the 'PC room'. And not very healthy CPU/GPU temps. So I switched off my quad FuryX PC, at least for two weeks, because of construction work in front/opposite of/to the house (not possible to open the windows during the day), and to think about a way to cool down more the 'PC room'. More pull out fans into the window or installation of an A/C. Then, it would be equal to use a 'guppi' .vlar or a .vlar task for bench test runs? Or it would be better to use a 'guppi' .vlar task? I would like to make bench test runs (I guess - because after nearly 1 year it's still not possible to let run 2 WUs/GPU on my FuryX's with the currently available drivers - this will not change in future, now I could start to make bench test runs for to find opti cmdline settings for AP and MB), but until now I didn't found the correct tools on the Lunatics site. For long time as I made AstroPulse bench test runs on my J1900 (iGPU + GT730) PC, I inserted the app with a few different cmdline settings (in BenchCfg.txt), after execution of the .cmd file the tool created the .wisdom file at (with) the 1st (cmdline line), and all other following cmdline (lines) settings the task (.wisdom creation) run were skipped, and then the 'real' bench test run started with the test tasks. I used _WisGenA.wu, made a copy of it named it _WisGenB.wu - and this two tasks in the folder TestWUs. Then this both tasks were used for to create the .wisdom file and all other files (*.bin_V7_*, .bin_*****VM). Then the 3 'real' test tasks were calculated. Could someone of the Lunatics crew make 'new' 'longer' bench test tasks (for fast GPUs)? Maybe 2 mins VHAR, 4 mins mid-AR and 6 mins ('guppi') VLAR tasks? So that they are good (and have everything) for to make bench test runs (on fast GPUs) for to find fastest cmdline settings. This would be very helpful and I would be very grateful. Like I described above, with the 'MBbench 2.10' it don't work like with 'APbench211_minimal' (here is the #ap_genwis.dat file included) in past. If I would continue with the work around way like above mentioned, task #1 and #2 the _WisGenA.wu, for to create the .wisdom file (2nd run of a task, .wisdom file creation finished), this would be waste of time... - or how would it work with 'MBbench 2.10'? I copy the VHAR, 2x mid-AR and VLAR task into the TestWUs folder. _WisGenA.wu and _WisGenB.wu (copy of *A*) also into the TestWUs folder. ...then the _WisGenA.wu and _WisGenB.wu runs at line #2 and #3 are for nothing, needless. Or how it would work? Raistmer, could you (the whole Lunatics crew, and/or advanced SETI members) make a description how to make bench test runs (maybe at the Main or Lunatics Forum)? All possible commands, which numbers possible, if they are connected or alone and possible changes? How much tasks/GPU (just for NV). This would be very helpful and I (I guess many others also) would be very grateful. Message 58312 - Posted: 16 May 2016, 7:15:14 UTC - in response to Message 58079. No plan to pass 8.12 to production to Seti@Home?? yep, there are such plans. Next week or maybe after. Are we going to have a VLAR/No VLAR to GPU, switch test on Beta soon? Message 58425 - Posted: 30 May 2016, 2:16:08 UTC - in response to Message 58409. I'd like to see something like this,too.